Is the Accu-Chek Guide SimplePay program right for me? Two simple ways to get your free meter. I prefer picking my strips up from the pharmacy. 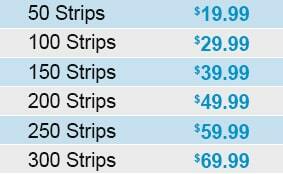 Choose the number of strips you need and how often you want them sent to you. Tell us a little bit about yourself to start saving today. Provide your credit card information to set up automatic billing. Shipping is free! I prefer free home delivery. Okay. You will only receive a confirmation e-mail for this request. Yes, please send me updates and special offers by e-mail. Tell us a little about yourself, so we can create the right card for you. Call your doctor for a prescription for an Accu-Chek Guide meter and test strips. Bring your card and your prescription with you to start saving. Your Confirmation E-mail Has Been Sent. We’ve sent you an e-mail, so you can also print your card later. You'll also receive an Accu-Chek Alerts welcome text message shortly. Just reply "Yes" to confirm. Then we will send you a handy link for your new Accu-Chek® Guide SimplePay card. Sign up and get your card. Call your doctor for a prescription for an Accu-Chek Guide meter and test strips. Or have your pharmacist call for you. Bring the prescription to your pharmacist along with the Accu-Chek Guide SimplePay card. 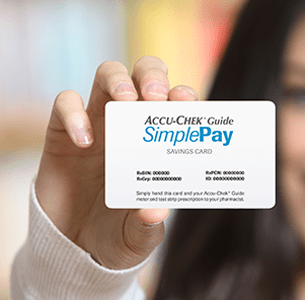 If you are insured by any government healthcare plan, you are not eligible for the Accu-Chek Guide SimplePay card. Here's the good news—you can still get a FREE Accu-Chek Guide meter! Accu-Chek products are always covered by Medicare Part B at the same low co-pay as all other brands.1,2 Learn more about Medicare Part B coverage. 1 Coverage may vary based on your conditions and other factors. 2 For suppliers who accept Medicare assignment. *Free Meter Offer: Receive a free Accu-Chek Guide meter from a participating U.S. retail pharmacy with this voucher and a valid prescription for an Accu-Chek meter. By using this voucher, you certify that you understand and agree to comply with all program rules, regulations, and terms and conditions. Transaction information for this voucher identification number will be shared with Roche Diabetes Care, Inc. Roche Diabetes Care, Inc., has the right to rescind or amend this offer without notice. Offer valid at participating U.S. retail pharmacies only. Limit one meter per person. It is not appropriate to seek reimbursement from any third-party payer—including Medicare, Medicaid, or other government healthcare programs—for free products. 1 THE CARD IS NOT INSURANCE; IT IS A CASH DISCOUNT PROGRAM AND CANNOT BE COMBINED WITH ANY FORM OF HEALTH INSURANCE. Those insured by any government healthcare program, such as Medicare, Medicaid, the military or VA, are NOT eligible for this offer. Insurers may offer a lower cost option. 30- or 90-day Accu-Chek Guide test strip prescription required. Limit 12 vials per refill. Refills cannot be dispensed before 75% of previous days’ supply have elapsed. Program may be changed or discontinued at any time. ​2 Discount varies based on quantity of test strips purchased. See card for details. 1 The Accu-Chek Guide SimplePay Home Delivery option is a monthly subscription. You are not eligible to participate in a subscription plan offered by Accu-Chek if you are enrolled in or have medical or prescription coverage through any government healthcare program, including but not limited to Medicare and Medicaid, or where otherwise prohibited by law. 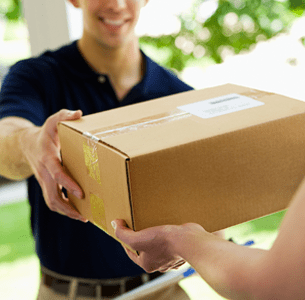 By choosing the Home Delivery option you are a subject to our full terms and conditions. 2 Limit six 50-count strip vials per home delivery order. Subscriptions available in one-, two-, three- or six-month intervals. 3 THE CARD IS NOT INSURANCE; IT IS A CASH DISCOUNT PROGRAM AND CANNOT BE COMBINED WITH ANY FORM OF HEALTH INSURANCE. Those insured by any government healthcare program, such as Medicare, Medicaid, the military or VA, are NOT eligible for this offer. Insurers may offer a lower cost option. 30- or 90-day Accu-Chek Guide test strip prescription required. Limit 12 vials per refill. Refills cannot be dispensed before 75% of previous days’ supply have elapsed. Program may be changed or discontinued at any time. Roche Diabetes Care, Inc., the maker of Accu-Chek products, communicates with customers to provide information on advances in diagnosis and healthcare, product innovations, and special offers. Roche does not provide your personal information to any third party without your permission, except Roche affiliates and business working on our behalf. You may always opt out of future marketing communications by calling 1-800-858-8072 or contacting us at accu-chek.care@roche.com. If you wish to unsubscribe from e-mail communications, you may also click the unsubscribe link in any e-mail you receive from us. This card is not insurance; it is a cash discount program and cannot be combined with any form of health insurance. Those insured by any government healthcare program, such as Medicare, Medicaid, the military or VA, are NOT eligible for this offer. Your insurer may offer a lower cost option. Accu-Chek Guide test strip offer: Discount varies based on quantity of test strips purchased. Prescription for Accu-Chek Guide meter and 30- or 90-day supply of Accu-Chek Guide test strips is required. Limit 12 vials per refill. Refills cannot be dispensed before 75% of previous days’ supply has elapsed. 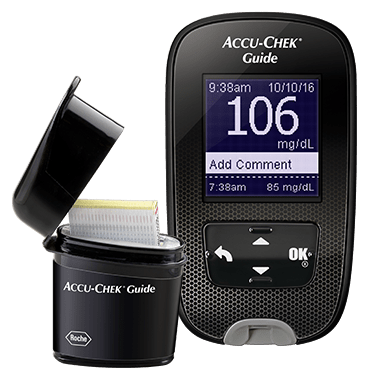 Accu-Chek Guide free meter offer: Accu-Chek Guide meter prescription required to receive one free meter every 24 months. 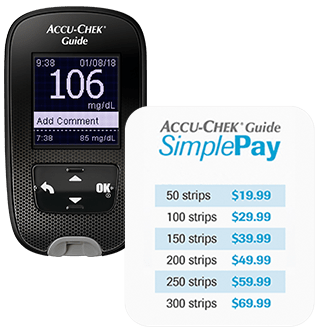 Transaction information related to the Accu-Chek Guide SimplePay program card and free meter voucher will be shared with Roche Diabetes Care, Inc., and any companies working on its behalf. 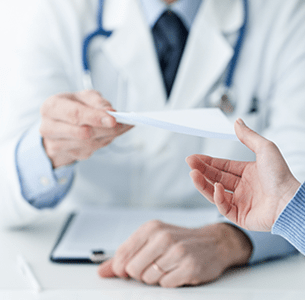 By using this card you certify that you will not seek reimbursement from any government healthcare program or private insurance for these offers, and understand and agree to comply with all program terms and conditions. Program may be changed or discontinued at any time. Only valid in the U.S. at participating pharmacies. 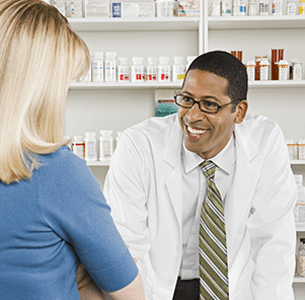 Pharmacist: Input Accu-Chek Guide SimplePay program as primary coverage only. Submit this claim to Argus using BIN 019158. A valid Other Coverage Code (e.g. 1) is required. For assistance with processing, contact the Argus Pharmacist Helpline at 1-844-373-0987. By checking the box to receive text messages and submitting this form, I agree to be contacted by Roche Diabetes Care, Inc. ("Roche") or persons or contractors acting on Roche's behalf at the mobile telephone number I have provided. I confirm that the mobile telephone number I have provided is associated with a mobile telephone belonging to me, not to a family member or third party. I understand that my consent to receiving text messages by mobile telephone is not required as a condition of purchasing any goods or services. If I do not consent, Roche will not be able to contact me by mobile telephone or text message. I am subscribing to receive recurring SMS messages from Roche in connection with its Accu-Chek Alerts program. I will receive no more than 6 messages per month. Standard messaging and data rates may apply. By participating, I agree to receive advertising messages with information on topics such as Roche’s products and services and healthcare. These messages will be sent via an automated dialing system. Text STOP to 60599 to stop receiving messages. Text HELP to 60599 for help. 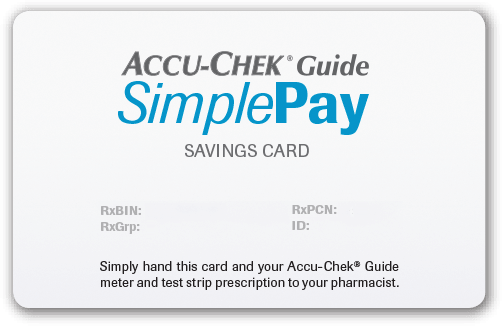 Bring the prescription to your pharmacist along with this Accu-Chek Guide SimplePay card. Receive your FREE Accu-Chek Guide meter and pay the same low price on test strips every day. 2 Discount varies based on quantity of test strips purchased. See card for details. *Free Meter Offer: Receive a free Accu-Chek Guide meter from a participating U.S. retail pharmacy with this voucher and a valid prescription for an Accu-Chek meter. By using this voucher, you certify that you understand and agree to comply with all program rules, regulations, and terms and conditions. 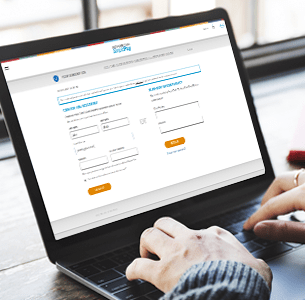 Transaction information for this voucher identification number will be shared with Roche Diabetes Care, Inc. Roche Diabetes Care, Inc., has the right to rescind or amend this offer without notice. Offer valid at participating U S. retail pharmacies only. Limit one meter per person. It is not appropriate to seek reimbursement from any third-party payer—including Medicare, Medicaid, or other government healthcare programs—for free products.